When Oliver Percovich moved to Kabul in 2007, he did what any lifelong skateboarder would do — he hit the streets looking for places to skate. He soon found an empty fountain to ride in his spare time. That drew the attention of local children, who would gather to watch the American do cool tricks. Percovich started bringing boards for them to ride, and before long he was teaching the kids of Kabul how to skate. He didn’t set out to help those kids heal from the ravages of war or bridge the socio-economic divides between Afghanistan’s ethnic groups. He never planned to create safe havens where 1,600 children, including a few hundred girls, in two countries can skate and play and just be kids. He just wanted to teach kids how to skate. Percovich’s excitement for the sport, and the kids eager to learn it, led him to found Skateistan, a remarkably successful non-profit that’s recently expanded to Cambodia. It hasn’t been easy. In the four years since it was founded, Skateistan has had to overcome the suspicions of locals, win the support of a mullah and face, firsthand, the violence plaguing Afghanistan. Sport has long been touted as a natural entry point for cross-cultural communication and a harbinger of change. Think of the Christmas truce that saw soccer matches played on World War I battlefields, or the unity the Springboks rugby team brought to post-apartheid South Africa. Skating is like that, but also different. There are no teams, so there are no enemies, only peer encouragement, self-competition and the natural urge to get back up after you fall. Any competition is friendly, and the sport is immediately intriguing to kids. “When I saw (the kids) getting into it and saw how divided they were internally as well as cut off from the rest of the world, I saw it as a bridge that could connect them globally,” Percovich said. Percovich, whose background is a research social scientist, noticed a few things when he followed his then-girlfriend to Kabul. First, it has an incredibly young population. Half of the city is younger than 16, and 75 percent is younger than 25. Second, and perhaps more importantly, the international community too often tries to solve Afghanistan’s problems with money, giving little ownership to the locals. Percovich wanted to give the kids, who only reluctantly handed those boards back at the end of each day, something of their own, something they could protect and be proud of. As he gave more lessons, he drew more kids, including some girls. That presented Skateistan’s first challenge. Afghan custom bars girls from mixing with boys once they turn 12. This gave Percovich the idea of an indoor skate park that would skirt that problem by enlisting women to provide the lessons. Then he sought the guidance of a mullah, who quelled locals’ concerns when he cited a passage of the Quran in which Mohammed speaks of girls running a race. As the number of kids grew, the level of attention Skateistan received did too. The Afghan National Olympic Committee donated a plot of land. IOU Ramps donated ramps and other gear for the skate park, which officially opened three years ago and is the largest indoor sporting facility in the country. Funding came from the German Federal Foreign Office, the Danish and Canadian embassies in Kabul and Architecture for Humanity. Ongoing costs have been covered by groups worldwide, including the Norwegian and Danish embassies and private donations. Skateistan began as a local NGO in Afghanistan and is now an official international non-profit with headquarters in Berlin. There’s a non-profit entity here in the U.S. (and also in the U.K. and Germany) that helps raise funds for the program. Skateistan chronicled its efforts in a coffee table book published last summer. The kids that Skateistan aims to reach are some of the hardest to access. They come from all walks of life within Kabul and surrounding areas, and many come from refugee camps or straight off the streets. Many of them have found Skateistan on their own, drawn by a sport they know little about but still find fascinating. Skateistan has grown to 40 full-time staff and many volunteers while fostering connections between ethnic groups deeply divided by generations of conflict. These days, 400 kids, many of whom might not otherwise associate with each other, skate side by side each week. It’s transformative. That’s subject to debate. Jay Coakley, professor emeritus of sociology at the University of Colorado at Colorado Springs, says such program rarely have an impact on the structural and political factors that cause ethnic conflict. Such programs must go beyond sports to succeed, Coakley said. To that end, Skateistan goes beyond skating and into the classroom, teaching kids everything from environmental responsibility to critical thinking skills, with curricula lasting three to four weeks. Violence and war are more than abstract concepts for the Skateistan crew, which saw two teachers and two students killed on Sept. 8 when a suicide bomber attacked the International Security Assistance Force Headquarters in Kabul. It was a chilling reminder of the environment in which many of the children live, and the challenges still facing their homeland. Many of those children sought solace at the skate park. Skateistan has proven so popular — it’s had a waiting list for boys in Kabul since it opened — that it will open a larger facility in Mazar-e-Sharif, a city of about 300,000 near the Uzbek border later this year. It will be twice as big as the building in Kabul, with a skate park, climbing wall and outdoor public space. The program expects to serve about 1,000 kids a week. The district government donated the land to the Afghan Olympic Committee, which in turn leased it to Skateistan. 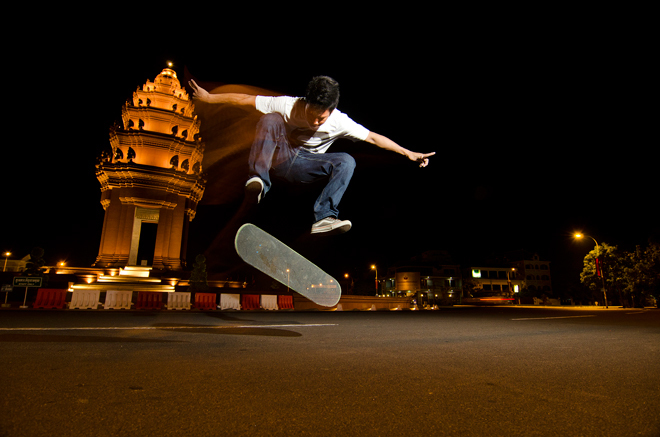 Skateistan also set up shop in Phnom Penh, Cambodia, on Oct. 1. That project started when Benjamin Pecqueur, a skateboarder living there, discovered the same thing Percovich did — the local kids wanted to skate. The Cambodian program started as modestly as the one in Kabul, with volunteers loading ramps and boards into a truck and driving around the city. They joined other NGOs in identifying kids from disadvantaged backgrounds, particularly at-risk girls. The program has since expanded to include a skate park and classrooms. Already it’s attracted 200 kids, about 40 percent of them girls. “It feels like we have a castle in the sky,” Pecqueur said. There may be no way of knowing the long-term impact Skateistan will have. Such things often are difficult to quantify, said Faye Wachs, a sports sociologist and professor at California State Polytechnic University, Pomona. But even if Skateistan doesn’t do much for the people of Afghanistan, it helps the children participating in it.